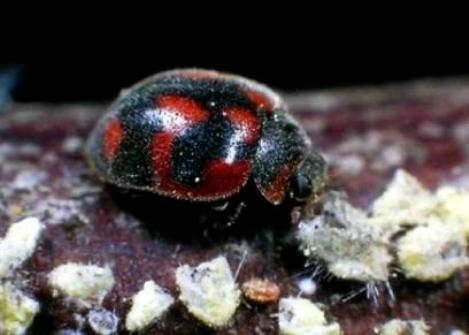 Region: This lady beetle is only known to be found in California and Florida. Life cycle: This beetle will produce numerous generations each season. Overwintering is done as a pupa on the branches and leaves of citrus trees. Physical Description: This lady beetle is identified by its red color with irregular black marks. In fact, black in the predominant color in the males. This round, convex insect is 1/4 inch long. The oval eggs are red and lay in small groups or singly on the host's eggs sac. The wrinkled, spindle shaped larva are pinkish, have many soft spines and are about 1/3 inch long. Feeding characteristics: Cottonycushion scale and other soft-bodied insects are the prey of both the adult and larvae.